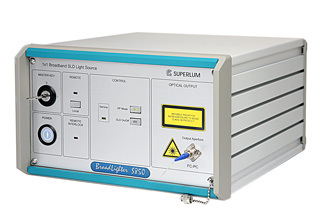 From July 2005, all S-series Broadlighters are delivered with RS-232 remote control capability. Superlum offers companion software to operate your S-series Broadlighter remotely from your PC/laptop. See the downloads page for details. In addition to these standard versions, we are able to supply customized versions of Broadlighter devices—contact us for more details right now! All light sources are powered directly from a wall outlet, 220 V AC or 110 V AC. Physical dimensions: 254 × 158 × 318 mm.